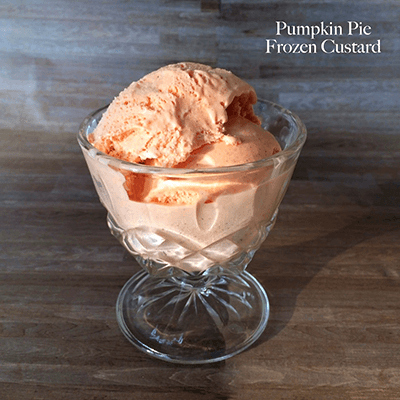 This low carb pumpkin ice cream recipe has tons of flavor and zero sugar. 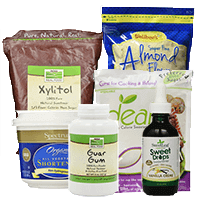 It’s made with Swerve, which has a glycemic index of zero– so it should have no effect on blood sugar. It’s ultra creamy and absolutely delicious– maybe more so than traditional, sugar-laden ice creams. I had posted in a Facebook group about how I purchased a bottle of Watkins pumpkin pie spice extract at WalMart a few days ago. Unfortunately, that doesn’t work for this ice cream because it contains a good amount of propylene glycol. What’s that mean, exactly? Propylene glycol is an anti-freezing agent. So basically, if you use an extract containing it, there is a good chance that your ice cream will never properly freeze. Instead I ordered an all natural pumpkin spice extract and added to the flavor by adding my own ginger, cinnamon and nutmeg. 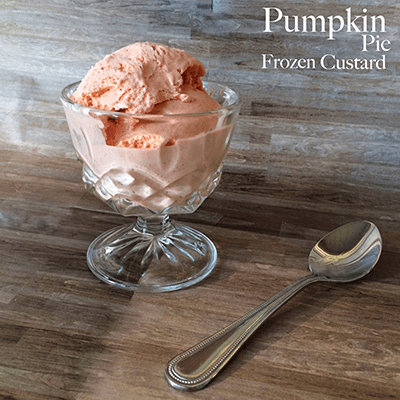 I use and recommend this ice cream maker from Cuisinart for making this low carb pumpkin pie frozen custard. Makes about 10 one-half cup servings. 2g net carbs per serving. 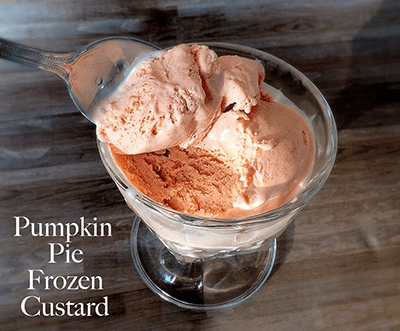 In a large bowl, whisk together cream, Swerve, salt, egg yolks, vanilla extract and pumpkin pie extract until smooth. Add in cinnamon, ginger, nutmeg and food coloring, if you're using it. Whisk well until uniform in color and all spices have been properly mixed in. Add cream mixture to ice cream maker according to directions. I use this Cuisinart ice cream maker and swear by it. It's is very simple to use and is cost effective. Allow ice cream to thick until it's the consistency of very thick soft serve. It took my machine about 40 minutes to get to this point (it was warm in the kitchen at the time, so I suspect that normally it would take 25 to 30 minutes). Remove from ice cream maker and either serve immediately or freeze the ice cream in a lidded container for at least 4 hours (preferably overnight) to ripen it. Scoop and serve.